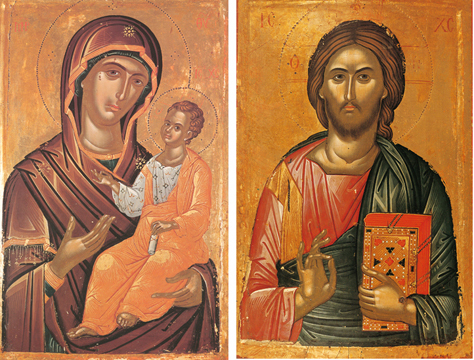 This fourth Matched Set of icons of Christ and His Holy Mother is from Stavronikita Monastery on Mount Athos in Greece. These icons were painted in 1546 by the Monk Theophanes, the great Cretan iconographer of that day, who also painted many of the murals for the main church of the monastery. The icon of the Virgin is fashioned in the style of Hodegetria, which is a Greek word meaning guide or directress, or indication of the way. In this icon the Most Holy Mother of God is guiding our path to God by her indication of Our Lord Jesus Christ. The young child, always shown with adult intelligence in His Face, for He was always consciously God, holds a scroll in His left hand and blesses with His right. Next to it is the icon of Christ that is a part of the fourth matched pair of icons. The Lord holds a jewel-studded Gospel Book in His left hand, and blesses with His right hand held to form the Greek letters “IC XC”, the abbreviation for Jesus Christ, which is the way that Orthodox priests give the priestly blessing. His face looks towards us but not directly, both looking beyond us only, and yet inwardly at the same time. As with most Byzantine art, it is not really symmetrical, showing a power of dynamism in its asymmetry, for God is not static, but dynamic, as is all that is made alive by Him. Powerful but loving, All-knowing yet kind, He sees all of our infirmities and still gives us unconditional love.